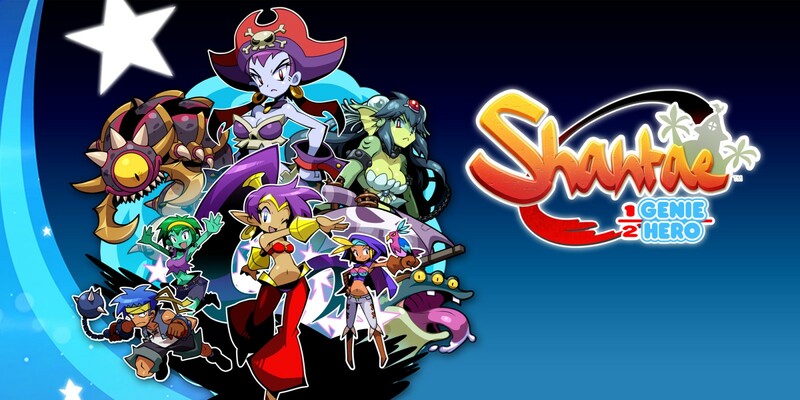 Most recently released on the Nintendo Switch, Shantae: Half-Genie Hero seemed like a perfect game to review on SuperPhillip Central due to the announcement of Shantae 5. I like to pretend I'm always this clever, but longtime readers have had to withstand some of my truly terrible review taglines for a while now. Regardless, here's the SPC review of Shantae: Half-Genie Hero. With the announcement of Shantae 5 (sure, it's just a teaser logo and nothing more, but don't kill my buzz, people! ), I felt compelled to try out a game that lingered on the shelf of my family's PlayStation 4 collection for a while now--Shantae: Half-Genie Hero. After taking some time to fully complete the game, I feel ashamed for not giving it my attention sooner. I was looking for an engaging 2D platformer, and it seems my wish for one has been granted with WayForward's latest. 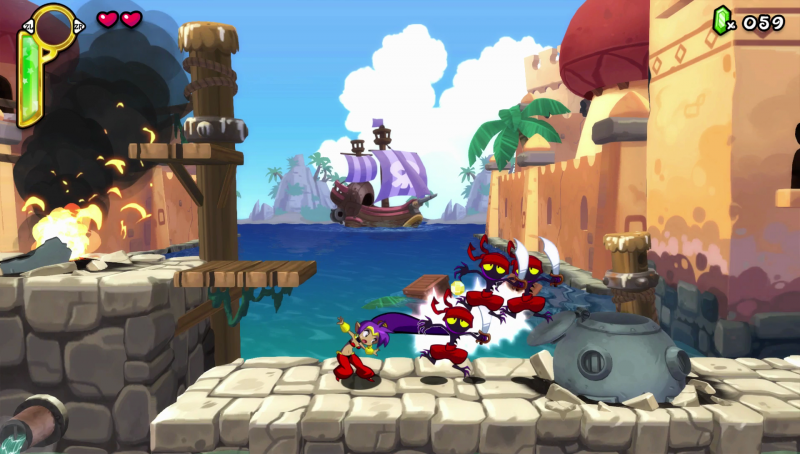 Shantae: Half-Genie Hero is structured differently from a Metroid-style game. Rather than having an interconnected world to it, Half-Genie Hero has a world map that you select various levels from. As you advance in the story, new areas are unlocked to visit and revisit. Revisiting areas with new abilities that Shantae didn't have before opens up the levels to reach new locations inside them to acquire methods of progressions and various collectibles. Shantae's long purple locks aren't just for show--they're also good for whipping up on enemies. It could have been extraordinarily tedious and repetitive to constantly return to past levels to collect this and that when new abilities are earned, but thankfully, Half-Genie Hero has a fast travel option that can be purchased in the in-game shop. This allows Shantae to warp to the next section of level without the need to run through it yourself. That said, it still would have been nice for levels with multiple sections to allow players to simply warp to the section they wanted instead of having to warp to one section after the other. 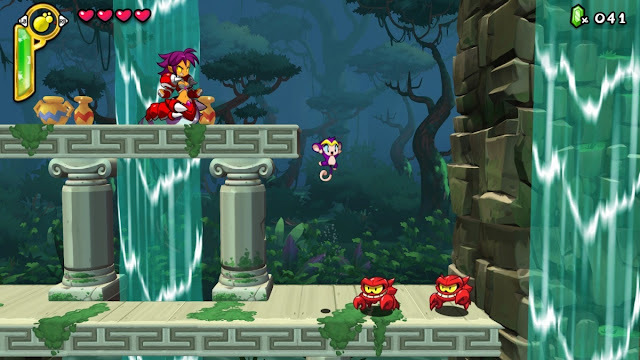 Half-Genie Hero has Shantae discovering animal transformations to turn into, granting her different powers and abilities, as well as extra mobility to reach areas otherwise inaccessible. 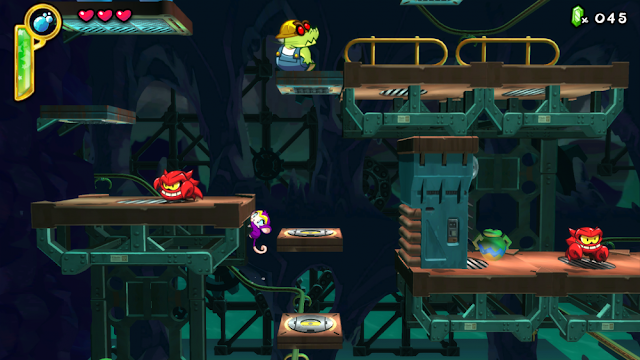 For instance, the monkey transformation allows Shantae to climb quickly up walls and fit through narrow passages, whereas the crab transformation grants her the power to explore the underwater depths. There are just under a dozen unique transformations in the game, and of this number, eight of them are required to reach the end of the game. The animal transformations have numerous abilities that can be added to their arsenals, allowing even more uses for each. Whether it's the crab's claw that can snip through grass blocks underwater, the elephant's ability to pound the ground to break blocks and uncover buried treasure, or the harpy's ability to fling her talons at enemies as a means to defend herself, the added abilities make already awesome transformations even more interesting and fun to use. Some abilities are more useful than others--for instance, the bat's sonar ability is only used for one room in the game--but most have multiple uses. Half-Genie Hero possesses a plethora of collectibles to uncover and collect, as well as goods to purchase in the game's shop located in the town. From collectibles that increase Shantae's maximum health and keys that unlock concept art in the gallery, to goods for sale like unique magic moves and equipment that boosts attack, defense, and magic, getting 100% completion in Half-Genie Hero takes some commitment. However, at the same token, even performing this task doesn't take too terribly long. My first run through the game with everything in the game collected took just over five hours. That's not to say Half-Genie Hero isn't worth the price of admission. Quite the opposite, in fact. Shantae's latest is a game that begs for repeated play-throughs, and is a speed runner's dream. It's a game that doesn't overstay its welcome, and when I was finished with a run through the game, I eagerly yearned for more. I'll take that over a game that lingers too long and I shelve it forever after beating it once. Shantae's monkey form can also leap incredibly high. Wayforward took the presentation approach of a previous title in its catalog, DuckTales Remastered, and pepped it up for Half-Genie Hero. There's the same 3D environments with gorgeous 2D spritework, and it looks absolutely sensational. The most astonishing visuals come from sections of the game that wraparound in a tower-like setting and feature bosses that take up the entire screen. Shantae: Half-Genie Hero is a visual treat and delight. Meanwhile, Jake Kaufman delivers yet another fantastic soundtrack that is mix of modern instrumentation with an infectiousness that harks back to the NES classics he's been noted to be inspired by. Voice clips by characters are occasionally uttered by characters both during gameplay and during various scenes, which is a nice touch, though I'd be lying if I didn't wish every line of dialog in cutscenes was fully voiced. Then again, for Kickstarted project, that's probably not overly realistic of me. "IT'S A GIANT WORM!" ...Sorry. I was having Gears of War 2 flashbacks for a moment there. Shantae: Half-Genie Hero is without a doubt my favorite Shantae game yet. It contains a platforming adventure that is just long enough to be satisfying without feeling cheated out of more, and when I did want more, I could sit down and play through the game again due to its relatively short length. 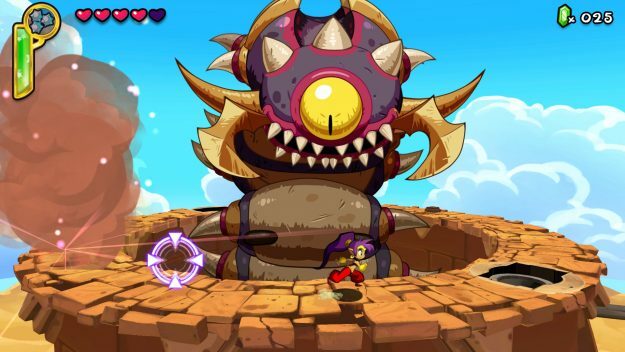 Half-Genie Hero is a game many fans wished for, and like a genie, WayForward happily granted their wish. I'm happy the development team did, too, because Shantae: Half-Genie Hero is another terrific entry in a vastly underrated series.